Hello TMK. I love your site and I hope this gets on your page. Ok, so on with the questions. (1a) Do any of you have a gameboy camera? (1b) If you do, why don't you put up the mario pics? (2) Can you give me sites for fake mario games? (3) In terms of space, are you the biggest fan mario site? (4) Where there any cancelled Mario games? (5) OK, what really happeened between Sony and Nintendo? (6) Ok, last one, What was the pupose for the Mario movie(released and the cartoon one)? David Dayton: I have a Game Boy Camera, but I haven't bothered to transfer all the Mario pictures over at this point (although I did help Fryguy over at The Nintendo Database with a few GB Camera things). 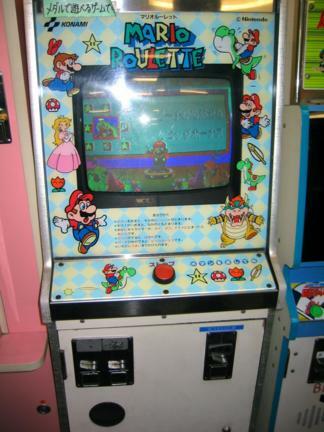 I know of no fake Mario games at the moment. There was a partially cancelled Virtual Boy Mario game -- Mario Clash seems to have originally been designed to be a standard platformer, but it was changed to a clone of the arcade game instead. Sony and Nintendo had a contract for a SNES CD-ROM attachment, but Nintendo's lawyers decided the contract was unlikely to help Nintendo out... so they backed out. This led to Sony getting rather annoyed and deciding to upgrade the add-on into a stand-alone system. If I had a copy of the animated film, I'd tell you. MEGAß¥TE: (2) Fake as in this crap, or fake as in homemade pirate type games? If it's the latter, I'm working (in the loosest sense) on a new section for TMK that will cover such games. (4) Yes, we cover them in the Lost Bytes section. (5) This has been discussed in several previous mailbags, but here's the link to the full story again. Sapphira: (1a) Yes. (1b) Don't think I can, and if I can, I dunno how. David Dayton: Go Go Mario! EGM: I know that in America, the most popular downloaded cellphone ringtone two months ago was the Mario theme. What do you think of this resurgence of all your classical music that you made popular? Koji Kondo: It's a surprise, and I'm very glad. I knew that some people have done similar things in Japan, but I didn't know that they were doing the same thing in the US. EGM: Why do you think that is, that your music has stood the test of time that way? That people have cellphones that could play real music but instead they choose your classic tunes? Koji Kondo: Well, yeah, I understand that people want to have a kind of nostalgic feeling with that, but more importantly, there are technical reasons. When it comes to the sound of a ring or a telephone, rather than really complicated or elaborate music, simple music is more suitable. David Dayton: Jeff, I do believe I'll have to add this to WTMK. E-mail me so I can properly credit you. Hey folks -- do you have a decent Mario cover tune? Let me know in the next mailbag. I'll broadcast the good stuff... and perhaps I can even scrounge up a prize for the best entry. Or not. What do you think, Deezer? Do you guys find all the additions to the Mario universe that the new games bring as confusing as I do? I'd like it if Nintendo slowed down in the making of the Mario games, maybe brought out more adventures along the lines of SMW, SM64 and SMS than all these party and sports games, etc. But maybe that's just me. Also do you agree with the fact that Nintendo might not be around much longer? I know it's a hard fact to deal with (I love Nintendo, yes I do) but they're losing more and more popularity outside Japan, especially as the PS and XBOX systems sell more and more. I think Nintendo need to change their market strategy to focus less on games for younger kids, otherwise (and I regret to say this) it's likely they'll go the way of Sega and just become another 3rd-party developer. Thanks a lot, guys. Keep up the good work. Chupperson: No, I don't find the new games confusing. No, I don't agree with that "fact." David Dayton: There aren't really all that many new "additions" to the Mario universe. The only really "big" changes have been the addition of Waluigi, the new Koopaling (Bowser Jr.), and the repeated occurences of Baby Mario and Luigi in games. There are an awful lot of non-Super Mario Bros. styled games out there now, but most of them are quite decent. I've always been partial to the Mario Party games, but that's probably because I have a good supply of people to play them with. Nintendo will be around for quite a number of years. Don't count them out quite yet. Deezer: I think it got out of hand with Baby Bowser (Yoshi's Island), Koopa Kids (SMB3), Bowser Jr. (SMS), and the K. Kids (Mario Party). Luckily, they haven't come up with any new kid Bowsers for a while. MEGAß¥TE: No, there haven't been any real sweeping additions that I'd consider confusing. Annoying perhaps. I do agree (and I suspect most people would) that I'd like to see more adventures rather than the party and sports games. I don't agree with the "fact" that Nintendo might not be around much longer. There is little likelihood of them becoming a third-party developer at this time... they are more profitable than Sony and Microsoft and still have $9 billion in cash reserves, as well as a solid grip on the handheld market and tons of popular IP. Sapphira: No, I don't find them confusing. The Baby Mario and Luigi being in games at the "current time" is ...bizarre, but that may be explained by the upcoming M&L2. All the Baby Bowsers, Bowser Jr., Baby Bowser (from SMW2 and Yoshi's Story) and Koopa Kids (Mario Parties) apparently confuse people, but I've never been confused by it. And, no, I also don't agree with that "fact." Hello, I don't know if you remember my last couple of mailbags, but if you don't, whatever, it's not important to what I have to say. I'd like to talk about the grave Nintendo seems to be digging themselves. Of course, that isn't about Mario directly, but it is indirectly, and I will try to focus a lot of this message towards Mario. Several Nintendo staff memebers have been quoted saying that "videogames now are too complicated, and their development costs too high, and that people don't want that". My question is, what are they smoking there? Mushrooms? Poisionus ones it seems. I'm baffled as to why Nintendo thinks that simpler games will overtake complex artistic masterpieces in the future. In all honesty, which game do you find better, Super Mario 64, or Yoshi Touch and Go? The first being an example of an enormous, complicated game, and the latter being a simple, cheap (development wise) game. Super Mario 64 has an actual objective, while Yoshi Touch and Go is a bunch of randomized levels. How do they think that the latter will be the future of videogames? What people want, and it's been very well documented within sales charts, are epics like GTA and Resident Evil 4. I'm not sure as to how many copies these "simple" DS games sell, but the industry has risen at least tenfold from the 90's because of these new epics, not because companies can produce simple 3,000 line code games (which might be an exaggeration, but you catch my drift). If what these executives say holds true, what do we have to look forward to with Mario? Will Super Mario DS be randomly generated and cost 1/4 the money it does to produce a game like Zelda? Will it have simplistic controls, allowing for a crappy control scheme and little to no customization? Nintendo's "revolution" honestly scares me, and I fear the worst for our pudgy friend. Nintendo seems to think that what they say is what holds true, which is totally false. It's no wonder that they are 3rd tier to Sony and Microsoft, because their logic is SO off. Sadly, I see them dropping consoles after Revolution, and if that is so, what do we have to look forward to from Nintendo? Some mediocre games that take 2-3 months to produce? Haven't we seen enough of that with the Mario Party series? I want big, huge adventures like Super Mario 64, and Super Mario Brothers 3, and I'm afraid Mario's past his prime, with Nintendo's new direction. Please comment on this situation, as I know some of you are very, very into this type of subject (I think Megabyte commented on my other subject which was like this), and would love to hear comments. Also, how do you think Mario will be taken online? I really don't see much except for an online Mario Brothers game, or co-op mode in the first Mario Revolution game, which would be cool. But this is Nintendo we're talking about, and they seem to be on a role with bad business decisions ever since the N64. Chupperson: Haha, online. Haha, complex games. Sure, big, complicated games are all great and stuff, but so are simple, fun games. And it's true, more big expensive games means less games overall, and probably less chance of good ones. Isn't Pac-Man still the most-played game ever or something? How are GTA games "epics"? David Dayton: I think the "simple" part has to do with the controls, not the depth of the game. Note how Resident Evil 4 was much simpler to control and play than any of the previous Resident Evil titles -- that's the sort of "simple" they are desiring, I believe. Oh, the first new online Mario game will be Mario Kart DS... although the Chinese have had online Mario Kart 64 for a while now, if I am correct. Lizard Dude: GTA games are epics because of the massive amount of content and stuff to do. GTA: San Andreas, for example, contains an entire state, 3 major cities, 11 small towns, 34 weapons, 12 chains, 50 oysters, 50 photo ops, 6 wanted stars, 8 gangs, 100 grafitti tags, 7 ammunition stores, 12 watches, dozens of restaurants, 11 radio stations, 100 horseshoes, 34 tattoos, 6 girlfriends, 2 triathlons, 2500 feet of mountain, 5 gymnasiums, 187 vehicles, 6 games of chance, 33 haircuts, 7 boutiques, 10 DJs, 65 shirts, acres of countryside, 44 pairs of pants, 37 shoes, 70 unique stunt jumps, 17 pairs of shoes, 56 hats, 155 music tracks, over one million clothing combinations, brilliant writing, and great satire of the '90s California. I'm not making this stuff up. MEGAß¥TE: I don't think you are correct, David. Eric, Nintendo execs have had quotes like that, true, but they've also stated that they will not stop with the epics (see The Legend of Zelda: Twilight Princess). Reggie addressed this when he said "Nintendo is not an 'or' company. Nintendo is an 'and' company." Just because they developed Yoshi's Touch and Go doesn't mean they are only planning to make simple games. Sometimes people want a long consuming game and sometimes people want a game they can just pick up and play for a while. Despite the major growth in the US, the video game industry hasn't been doing well in Japan. Nintendo is trying to gain a larger audience by reaching out to people that don't normally play games due to either controller barriers or other reasons. So far, it's been working: Nintendogs has been quite successful in Japan, launching the DS past the PSP in sales week after week. Brain Training seems to be doing well. There are different games for different demographics. Nintendo is simply saying that everything shouldn't be geared towards "HD gaming" because there are plenty of ways to have fun. Additionally, HD doesn't guarantee fun, just shiny. There is also some indication that the development barrier will be lowered so that smaller companies may have a chance at getting their games on Revolution... this means companies without large budgets and staff are likely to produce Alien Hominid type games: simple, yet fun. This is no way precludes the epics you so desire. Sapphira: Well said, MB. The option of having both long, complex games with deep plots and having more simple "pick up and play" games is nice. It reaches a wider range of people, depending on what they want in games; variety is good. Hello, staff of TMK. It's me again. Wait, I nearly forgot, New Mario Bros. is coming out. That should be a good title from the looks of the screenshots last year. DISCLAIMER: The information in this message is confidential and may be legally privileged. It is intended solely for the addressee. Access to this message by anyone else is unauthorised. If you are not the intended recipient, any disclosure, copying, or distribution of the message, or any action or omission taken by you in reliance on it, is prohibited and may be unlawful. Please immediately contact the sender if you have received this message in error. Thank you. Chupperson: Jungle Beat isn't part of the DKC series, is it? And, that kind of thing happens to Mario more or less regularly. New Super Mario Bros. is good. David Dayton: Jungle Beat is part of the Donkey Kong platforming series (which I'd loosely define as DK Jr., DKC 1-3, DK64, and DK Jungle Beat)... and much better than Rare's stuff. As far as the lack of the DKC characters goes... Mario games are lacking in later developed characters all the time. Super Mario Sunshine didn't even have Luigi in it! Lizard Dude: I'm not sure if I'd call Jungle Beat better than Rare's stuff, but DK Jr., DKC 1-3, DK64, and DKJB are all sort of different beasts in themselves. I think Jungle Beat nicely continues the Donkey Kong tradition of not having a tradition. Note that King of Swing continues this tradition as well. MEGAß¥TE: I was looking forward to the new consoles most at E3, so it was a disappointment in that regard... next year... I was also looking forward to Mario Kart DS: if I hadn't won a DS, I wasn't planning on buying one until this game came out. While I'm also looking forward to Conker, it's funny that you're more excited over a rehash and repackaged games more than anything else. Nintendo's been trying a lot of new gameplay ideas, many of which haven't been the greatest, but at least they try. I never thought MK64 was very polished, though Double Dash did have several glaring omissions. I do agree with you about SMS and Wind Waker, though the games were still fun. I think your Jungle Beat argument is just silly. New Super Mario Bros. will likely be a very fun game... it was a little barren in the E3 demo, but it's still early yet. Hey guys (and girl, you rox Sapphira!). I figured you might not have enough annoying mailbag questions. I'll spare you of some of the annoyingness and get straight to the questions. 1.) Do you feel the DS is too gimicky? It seems that all the games are inspired by old-school gameplay, you know, with high scores and stuff. I have nothing against that, of course, but Nintendo's got to realize they don't have the same audience they did 20 years ago. I personally haven't played PSP, but I have yet to see a review claiming the DS to be the better buy. Oh, and your e-mail boxes are flooded a lot. Maybe I'll make it in this time! 3.) They didn't release an official soundtrack for M&LSS, and yes, some GBA games do get official soundtrack releases. David Dayton: The DS has many interesting features -- gimmicks only come when a developer tries to shoehorn them in at the expense of gameplay. Most of the DS titles coming out later this year are just really good games, and that will help it. The New Super Mario Bros. is quite fun. Toadette is acceptable, although I'm still annoyed that the NOA localization department decided that "Toad" is the name of the species the Mushroom people are, and not the name of an individual. A few GBA games get officially released soundtracks. Others get fan-made soundtracks. Cough. MEGAß¥TE: 1.) No. Nintendo is banking on some of their same audience. They're also trying to get non-gamers, something easier to do with non-standard game controls. Early reviews liked the PSP, but now that actual software has come out and with a great E3 showing, most everybody has shifted their attention back to the DS. Lizard Dude: 2.) Haha, easy on the eyes. Deezer: 1.) I don't know the exact US sales numbers, but the Japanese certainly think the DS is the better buy. And I do, too. 2.) I've gotten used to Toadette. But hear this: if they make a Toadsworthette, LITTLE MUSHROOM HEADS WILL ROLL. Long time no see, budds. Yeah, kinda neat. And uhh... I can beat level 2-3 in 13 seconds. Dang that took a long time, but i can't get it any better. And P.S. Update Secret page more often. It's getting lame. David Dayton: Nifty. I'll have to remember that. Did you know that Donkey Kong's ending credits music changes if you play it on a Super Game Boy? MEGAß¥TE: So does Pauline's scream. Lizard Dude: Does it get better quality, or what? Chupperson: No, it runs 1.024115 times faster. Don't u guys think that a side scrolling platform game like SMW, but with 3D graphics would be great? I like the 3D world games, but we are without a side scrolling Mario game in the console systems since SMW2. Chupperson: I take it you haven't heard of New Super Mario Bros.... No, it isn't on a console, but that's okay. David Dayton: New Super Mario Bros. is quite good, although it needs a better title... and Chupperson, I'd be interested in hearing you explain why the DS isn't a video game console. Heh. MEGAß¥TE: NSBM looks to be a great game, particularly with the 2-player mode. It's a little unfortunate that they're using DS 3D because it just doesn't look that great... but it'll still be fun. Lizard Dude: ProTip: The farther out you hold your arms, the better the graphics get! Chupperson: Because it's a handheld, not a console. Duh. All in all, it was the best thing I had ever seen in my life. I'll have pictures in a week or so if you want them. David Dayton: I want those pins... and the bottle of water. MEGAß¥TE: Pictures would be sweet; I'm particularly interested in the Nintendo AVS. I remember the Desert Storm Game Boy in one of the earliest Nintendo Power issues, amazing that they kept it. 2. Do you think Geno is cool? I do! 4. What system do you think Mario 128 will be on? That is all! Peace Out! David Dayton: The new Smash Bros. game needs Wario. That's the only addition I really want. Oh, Geno is tolerable and the new Mario games are rather fun... especially Mario Strikers. Lizard Dude: 1. Pit, Wario, maybe some standard enemies like Metroid, Shy Guy, etc. 3. Nah, Mario can do anything. This was first proven when he became a doctor. 3. Not really. Those all seem pretty cool. Sapphira: 1. Diddy Kong would be cool, since DK doesn't have any "friends" with him in those games. Plus, moves wouldn't be that difficult to "create" for him. 2. Of course! Geno's awesome. Back in the Dec. 13, 2004 mailbag, there was a question from nman202 asking if the DS or the Revolution had more potential than the other (Qusetion 7). J. J. made a reference to something called a "Work Boy". Was this a joke? What the crap is a Work Boy?! David Dayton: The Work Boy was a productivity kit planned for the original Game Boy, complete with a keyboard. It would have turned the Game Boy into a personal organizer. I'm still not sure as to whether or not it was ever actually released. MEGAß¥TE: J.J. told you to look it up :-p. Yes, the Work Boy was released. Lizard Dude: Yoshi, Fawful, Bowser Jr.
Chupperson: Mario, Luigi, Peach, Toad, E. Gadd, and everyone else. Sapphira: Yoshi, Peach, Goombella, etc. I found this when I was looking for Mario sprites! Pretty neat huh? MEGAß¥TE: Yeah, we've known about this for a while... we'll be adding the missing arcade games to the site soon. Deezer: Where have you been, NintendoDSLee91? The arcade game list was updated in March with five arcade game titles, this being one of them. More info coming sometime or another.